Turkey hunting in the wide-open spaces of the West can be a very different game than working gobblers in the East, South, Midwest — heck, just about anywhere else. To be successful, hunters must adapt their tactics. Proven tactics can't be put out to roost (forgive the horrible pun); rather, hunters must add some tools to their bag of tricks and learn to think outside the coop. I never would have found — and hunted — that huge old black-bodied gobbler had I not been a disciple of using optics to find turkeys. It was after the rut (never have been able to reconcile that word to a bird) and the hens were solidly on their nests. The tom rarely gobbled, and never after the first few moments of dawn. Through a stroke of luck I discovered where he roosted in the canyon bottom, and for three consecutive days I climbed the north canyon side and watched him pitch down and immediately head straight up the south canyon wall — and it is a wall — climbing like a Frenchman with ambitions on Everest. The fourth morning, I was in his path, but he vanished into the oaks. The fifth, I ambushed him — and to my everlasting disappointment missed. You'll never know shame until you have to admit to your toddler, your three-year-old, and your Kindergartner that you just missed "the big one" at less than 20 yards. 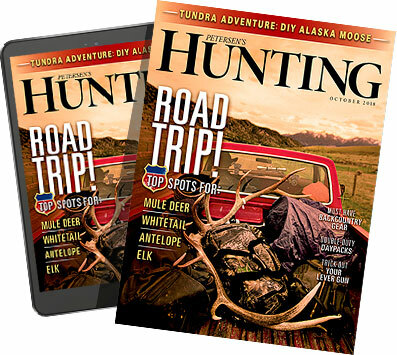 According to Tom Wiley, founder of Flextone calls and a man with more turkey hunting experience than any 10 ordinary hunters, in-season scouting is more important in the West than in the East's thick woods, and his binos are a critical tool. "There comes a point, late in the day, when if you're not between the turkeys and their roost, you're not going to kill 'em. When that point comes, I get in the truck and go look for more turkeys, watch them roost with my binocular." Learn to always carry your binocular, and don't hesitate to use it. Often, distant turkeys look like little black kernels of rice slowly creeping along. Until I watched that feathered old veteran climb straight up a canyonside — one that intimidated me — I used to think that turkeys were just a bit lazy. I mean, "fat turkey" is almost a cliché, right? Any more, I make a point of never predicting where a tom won't go. I still look for terrain of the sort that turkeys commonly favor, and start there, but when scouting I attempt to get up high above such areas and glass. More than once I've discovered turkeys cheerfully doing what no one expects them to do across unthinkable terrain. Keep an open mind and adapt, and you too may have the opportunity to miss a big old trophy tom. "According to Wiley, "The best calling and decoying in the world are really no match for just being where the turkey wants to go." Importantly, where the country is open and the terrain broken use that terrain to your advantage. Stalk into calling position behind river bluffs and down southwestern arroyos. Use natural topographical funnels to ambush birds moving from roosting to feeding areas and vice versa. Find vantage points and glass. Turkeys do use terrain, but unpredictably. Reading and using terrain is often more about how you use it than it is about how the birds use it. Quickly developing a reputation as the best close-range tom-decapitating technique in the West, fanning is deadly on wild turkeys — especially, according to Wiley, on Merriam's. It can be deadly on hunters, too, if used on public land amongst trigger-happy other hunters. Especially in areas where rifle hunting for gobblers is legal. So be careful. Like many other tactics, fanning is not limited to wide-open spaces — it's useful on turkeys everywhere that hunters feel safe posing as a horny tom. But it's particularly useful where cover is scant; where turkeys are call-wise; and where stalking is required. That's the West in a nutshell. To get started strutting your fan, you'll have to get your hands on a real-deal turkey tail. Preferably a big one — it's hard to hide behind little fans. Break it out when a wily gobbler hangs up out of range, or just ignores your calls no matter how seductive you sound. It's also worth pairing your chosen fan with a set of knee and elbow pads, because if you're willing to crawl on your belly through prime turkey terrain, you can often hide behind your feathers and work your way right in on a gobbler that is too busy living life to come to you. Beware, though: once you get inside his comfort zone he'll come running to give you a drubbing. Seen what gobblers sometimes do to decoys? Don't let that be you. Wiley uses Flextone's Thunder Chicken, a decoy/fan combining the front half of a turkey body with an artificial fan, and points out that it's helpful to get in the right height of grass, which helps conceal you lying behind the decoy. "Remember, too, that when a gobbler struts, his fan isn't always straight up. Move your fan at an angle&apos;¦ tilt it around and turn it toward the turkey," Wiley said. Interestingly, many hunters miss the first shot on a tom that they've fanned in. Why? Most of it has to do with the fact that at only a few yards the shot pattern from that upscale Xtra-Full choke you got for Christmas is only an inch or two in diameter, making it hard to connect on a golf-club-narrow turkey neck. Additionally, of course, is the fact that being so close to a spitting, strutting tom that you have to look UP at it from your belly-crawl tends to set your nerves to jangling. In the best of ways, of course. Bring your best turkey calls and tricks west with you, but be prepared for wind. You won't have many foggy, still mornings where soft little clucks can be heard. Box calls are versatile — they can be worked softly or so loudly that they hurt your ears. So is Flextone's Thunder Cut'n, an easy-to-use blow-through call that produces loud cutts, yelps, and gobbles. According to Wiley, "The best calling and decoying in the world are really no match for just being where the turkey wants to go." Wiley also successfully employs aggressive gobbling:"If a flock pitches down and heads away from you, soft clucking and yelping isn't really going to change their course. I've had good luck gobbling aggressively at flocks like that: the gobblers will answer almost every time. They hang up and gobble back at you. If you keep the gobblers occupied long enough, the hens leave. I've already got a decoy out, and when the hens disappear I switch to hen calls. Suddenly, I'm the only hen in town." And in the West — history has it — the only lady in town gets a lot of attention.